Are you hosting an event in your city or neighborhood for TEXAS GO VEGAN WEEK? Click on the 2018 Texas Events above to see the list! The list will be updated on a daily basis through the first week of October. There are many ways to participate, including meetups, film screenings, street activism, cooking classes, tabling and more. Be sure to also visit the Vegan Society of P.E.A.C.E. Community Events Calendar for events taking place all week here in Texas! Please remember to submit your event to texasgoveganweek@vegansocietyofpeace.org! If you are a vendor in Texas and would like to participate in TEXAS GO VEGAN WEEK by giving special discounts and coupon offers this week, please contact us! To view current coupons, click on the 2018 Offers & Coupons which will be posted as early as September 15. We can provide an image to link directly to the special offers page from any SmartPhone. We can also provide TEXAS GO VEGAN WEEK cards and flyers for your business upon request. 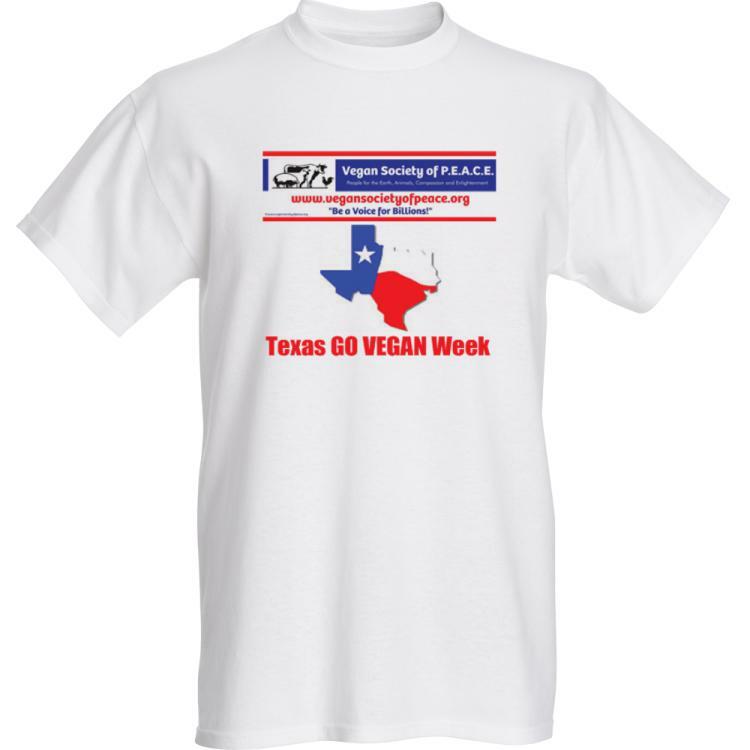 Support Texas Go Vegan Week by wearing one of our cool shirts! Please support all vegan restaurants, vendors and vegan product companies in Texas! Help this campaign grow!